KM FISH MACHINERY A/S is one of the leading suppliers of complete shrimp and fish handling systems for installation on board fishing trawlers and in land based factories. KM Fish machinery A/S delivers machines and processing equipment as well as turn-key factories for fish processing facilities world wide from Greenland in the North to Australia in the South. Moreover, we offer custom filetting- and skinning solutions. Our fish handling systems and machines can be installed on small as well as large fishing trawlers. 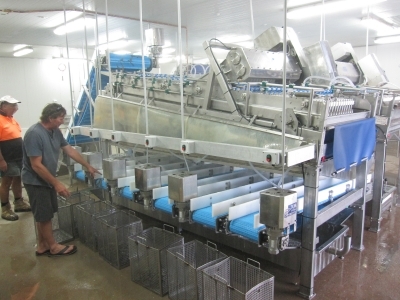 Especially the fish gutting machines and fish grading machines are installed in many boats. In recent years, KM Fish Machinery A/S has also developed systems for the land based shrimp processing, including the shrimp farming facilities and peeling solutions for both land based and on board shrimp processing.